I’ve never been much of a souvenir collector – with two notable exceptions. I have always collected ticket stubs, particularly from sporting events, and I have amassed a rather large collection of sports jerseys over the years. Neither collection was intentionally compiled – as in, I never consciously had a thought to keep ticket stubs or fill a closet full of jerseys – but, in both cases, and rather organically, I have done both. What links both my ticket stub collection and my jersey collection (both of which are embarrassingly large, I might add), besides the fact that they are sports-focused, are that they each are about personal memories and nostalgia. I suspect any sports memorabilia person would look at these collections and see little of any monetary value at all. But, to me, they bring back a wealth of memories – great games, wonderful journeys to distant lands, and time spent with family and friends – and that makes my collections priceless. I often find these collections are a source inspiration – that the next game and the next journey may add another sport artefact. However, there are some artefacts in my collection that emit the sweet sorrow of nostalgia, as I know that their power lies in the fact that what they represent is forever in the past and shall never, ever return. 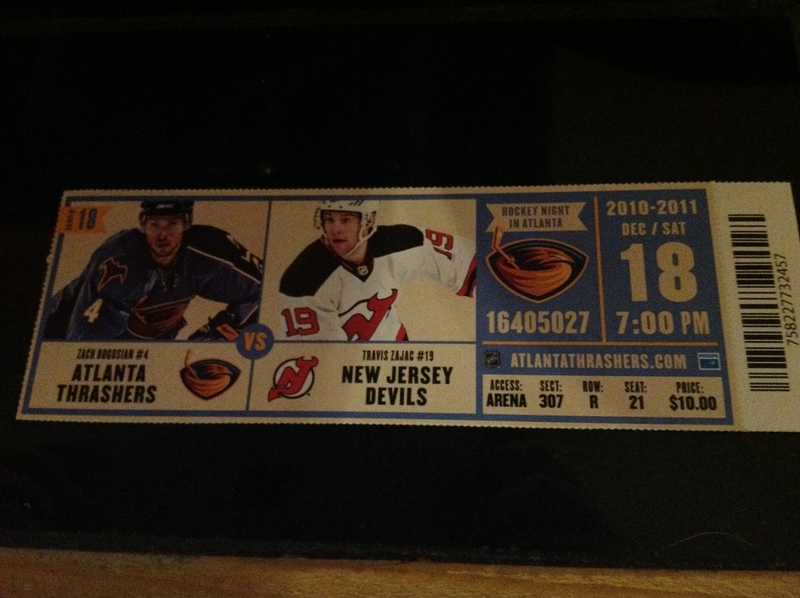 I became an Atlanta Thrashers fan shortly after moving to the South. I loved having an NHL team near to me – I grew up with the game in Canada, and professional hockey in the South was far more affordable to attend live than back home. Honestly, it was nice to see top tier hockey without having to mortgage a house in order to do. However, rather quickly, my interest grew from merely watching NHL games to actually supporting the team. The Thrashers weren’t particularly talented, but they worked hard and, frankly, they looked like a team in need of some love. They had some successful years at the gate but, by the time I came around, they were struggling a bit – both on and off the ice. In any event, when the 2010-11 season rolled around, my wife and I decided to take the plunge and become season ticket holders. Despite the fact we lived two-hours by car from the arena, we loved the ritual of wearing our jerseys, driving in to town and listening to various hockey and non-hockey podcasts, cheering on our boys, and listening to Dan Kamal‘s post-game show until the signal dropped out. At first, it looked like we had picked a great season to come on board. Through the first thirty games or so, the Thrashers were competitive, and winning much more than they were losing. By mid-December, there was actually a buzz about the team, fans seemed to be coming back, and there was lots of optimism about the team’s future. December 18, 2010 was the pinnacle – a full arena on a Saturday night and a 7-1 victory over the New Jersey Devils, topped off by a hat-trick by tough-guy Eric Boulton. The demise of the Thrashers after that game was quick, and very, very painful. Not only did the team begin to lose, and lose often – falling out of playoff contention in the new year – the team was put up for sale in late December 2010 and, after a very short search for local ownership, was moved to Winnipeg in May 2011. We went into a kind-of mourning after the move – I was rather depressed and irritable for some time, and my wife vowed to never love a sports team again. I used to look at the ticket stub from that game against the Devils often in the months after the move, deciding to keep it separate from the rest of my collection – perhaps because it represented something of the antithesis of the rest of my collection. There was no hope, no promise, and no journeys to come. It has been over two years since the Thrashers last graced the ice in Atlanta. We’ve moved on, both in our fandom and in our lives. For me, I’m not really bitter anymore, but I still miss my team. I try to remember that night in December, not as the beginning of the end, but of one of those magical evenings that happen every once and a while in sport. Without the team moving, I’m sure I wouldn’t remember the night as vividly as I do now. I’m sure the nostalgia I have would simply be trivia. 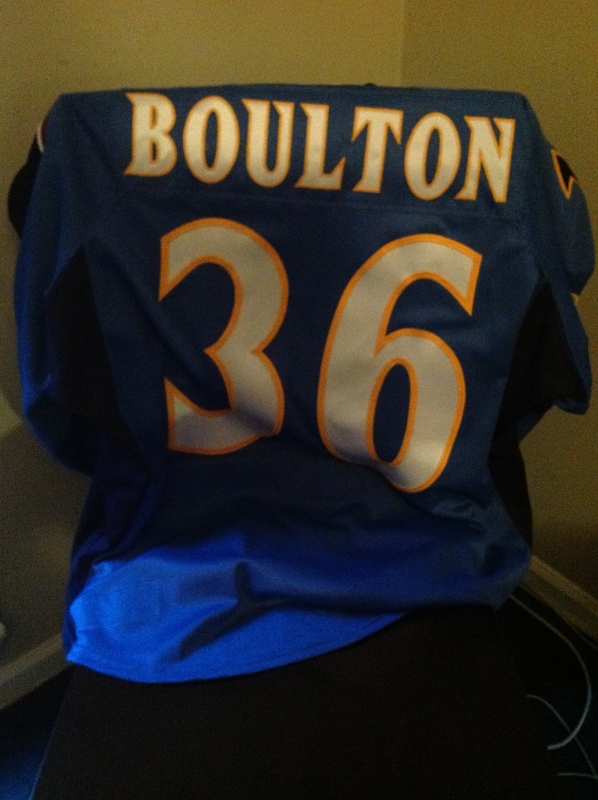 I probably wouldn’t look up what Eric Boulton is doing now, nor would I have purchased the jersey he wore that night. I plan on framing the ticket and jersey together, hanging it in my basement, and waiting for the day my son asks me about it. I hope to tell him about a great night his mother and I spent watching magic happen, how it was something we’ll always remember, and how it makes us smile. I suppose that’s how heirlooms are created. By Gregory Ramshaw in Uncategorized on July 29, 2013 .